Are you a designer looking for a community of like-minded creatives? A business owner or agency employee who wants to understand design’s role in your organization? Then you might want to check out the South Dakota chapter of AIGA: the professional association for design. With a primary goal of advocating for design and local designers, the local AIGA chapter is South Dakota’s number one resource for anyone with a passion for design. We sat down with AIGA South Dakota’s Communications Director, Andrew Brynjulson, to learn more about the organization’s role in our startup community. “What we believe is that if we fill the community with a bunch of talented, confident, competent designers, they’ll use their skills to make the community better,” said Brynjulson. One of the most common misconceptions, says Brynjulson, is that AIGA is only for graphic designers. While a majority of those involved are focused on graphic design, the organization supports all facets of design. In addition to designers, Brynjulson says AIGA eagerly welcomes those who simply have ties to the design world, whether as project managers, business partners, or content strategists. The South Dakota chapter is run by a board of nine local design minds, including Hugh Weber, who is also part of the national AIGA board. According to Brynjulson, design is often relegated to simply aesthetic when, in fact, it’s much more. AIGA’s goal is to advocate for design as a vital aspect of a successful business. As a business owner, design is a key element of distinguishing yourself. According to Brynjulson, it’s never been more relevant than it is now. With so many channels for businesses to live and thrive within, including print, social media, and the advertising space, it offers a unique and cohesive foundation to build upon. “Until consumers don’t have eyes and emotional responses, design will continue to be relevant,” Brynjulson said. AIGA South Dakota’s current board has been active for about a year now, and one of its primary goals has been to increase the amount of events and offerings for both members and the public. 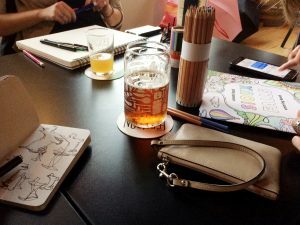 Events range from educational, such as speakers brought in from across the country, to social, like monthly Drink & Draws where the group meets up at local establishments like Fernson or The Source and spends time drawing together. Recently, the chapter has also started two new events called Agency After Hours and Tour de Shops. Agency After Hours events allow designers and other employees to visit companies they might not have the opportunity to learn about without actually working there. Recent visits have been to Lemonly and Fresh Produce. Tour de Shops events were inspired by the idea that there are numerous local businesses that employ and support designers, such as hospitals, banks, non-profits, print shops, and signage companies. The first couple tours have been to Sisson Printing and Smith & Smith. AIGA is also working on an event series called Show & Tell, which will operate in a similar style to 1 Million Cups. They plan to bring in local speakers with ties to the design community. “We’re talking about work, celebrating local work, bringing in outside perspectives, and also hosting community building events where it’s a straight-up social hour,” said Brynjulson. The goal of these events is to stir up the community and keep it active, according to Brynjulson. The best way to stay aware of upcoming events is by following their Facebook page at AIGA South Dakota. In 2017, the chapter launched an annual funding program called the Idea Fund. AIGA members are invited to submit proposals for short-term design projects that seek to benefit the local community. Up to three projects are chosen, and recipients are given funding of up to $1,000.00 to turn their ideas into reality. Past projects have included a Sioux Falls-themed coloring book, and a community mural in Vermillion. All project funding comes from the generous support of AIGA’s members. The 2019 application process closes on April 15, and recipients will be announced May 1. 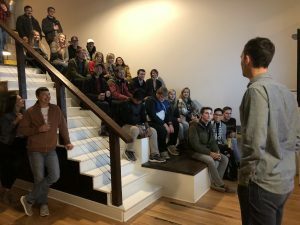 The projects must be completed within six months, and the public will have the opportunity to view presentations on the projects during Sioux Falls Design Week in October. For more information on the project requirements, view the application here. While many of AIGA’s events and speakers are free and open to the public, membership comes with some valuable perks. Benefits include discounts on a variety of softwares and retailers, including Apple, WeWork, and CreativeLive, among others. AIGA members are also eligible for health insurance enrollment assistance. In addition to these partner discounts, as a member of AIGA, designers are listed in the organization’s official directory, are given an exclusive Behance member portfolio, and receive access to AIGA’s job listings board. Locally and nationally, members have access to powerful networking and educational opportunities, including webinars, courses, workshops, and events, both online and in person. There are five different membership levels, making involvement a possibility at any budget. Starting at $50.00 annually for Contributing members and capping at $2,500.00 for Trustees, membership fees are what make AIGA’s benefits and offerings possible. Benefits vary by membership rate. Group membership is also available for companies that wish to offer membership to their employees. Group rates began at $675.00 annually. Click here for a full list of member benefits and discounts. Like/follow AIGA SD on Facebook (@AIGASouthDakota), Twitter (@AIGA_SD), and Instagram (@aigasouthdakota) to stay aware of upcoming events and projects. Inquire about membership by contacting the chapter, or applying online.